David spent a lifetime overcoming his fears. God knows he had enough work to do, and not enough time to do it in. But the rhythms of the machines next to his bed, the regular interruption of intercom calls, and the hum of fluorescent lighting overhead all combined in his mind into one sickly dirge announcing his death. The one fear he had yet to conquer. David depressed his thumb to raise his head up. Perhaps it would reduce the pressure behind his eyes, not to mention the stupor of painkillers he knew were constantly flowing past the bruise in his arm via the IV. How had his body become so frail, he wondered? His arm seemed like an arid desert, patches of purple and red like murderous empty lakebeds. The room’s airflow pushed flakes of dead skin around like startled birds looking for food. The elevation of his head seemed to bring some clarity, but his weakened frame could hardly obey any initiatives, so David settled on doing the one thing he could do – remember. When had the fear entered his life? “Early,” he thought. Some dreams of childhood never seem to fade like other memories. Standing in the dark on an infinite plain, a boy of maybe four years. He hears a low, guttural growl like a Disney dragon, or like the Hollywood sounds of the possessed. He runs. He runs right into it! It strangles him and he wakes. How many times had he had that dream? Twice? Four times? More? David remembered the night he realized that he had no idea which direction the demon was advancing from. In the later repetitions of the dream, he would wait until it inevitably reached him. Then he would awaken, still feeling the pressure around his neck. As a pre-teen, David had tried to forget his frightened childhood. He had not yet realized that such nocturnal visits were probably his mind’s way of surfacing the instability of his home life; his father’s imprisonment, his mother’s crying. All he knew was that he was smart in school. Too smart. He had skipped a grade. For a smart child, this seemed the best choice in the public school system. But only in retrospect could David see the new fears that would enter his life through being younger than his peers. The social interaction with girls was – incomprehensible. They giggled and made fun. They gravitated to taller, stronger, older boys. David recalled his feelings of smallness, both physically and personally. Others were so much more capable of the social dynamics he watched from his silence. Trying to be funny to fill his insecurities always seemed to end in disaster – why were his jokes met with guile and demeaning looks? But nowhere had David found the combination of all of his insecurities focused like at the pool in the summer. He loved playing in the standable depths, but swim out to the raft across the frigid, lightless deep? No. David recalled the many home movies his Grandfather had taken of his swim class basking on the raft, while he stood, a lone shivering figure at poolside. Skinny. Small. Ashamed. Scared enough of the deep to suffer social humiliation. Years later, David had overcome his fears of water easily, but that water then? He had attempted to cross it before. It wasn’t that he needed to touch the bottom to swim. 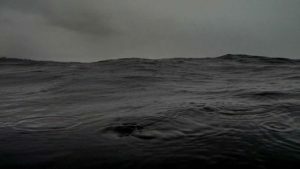 It was the invisible coldness that sucked the power from his muscles, that froze his mind into a state of panic, that told him he was going to be submerged into the fear forever. It was no wonder David moved from his chilly hometown to California. The sunshine and warmth were a constant hedge against the cold – against death itself. The cold meant being isolated, sightless, deaf, and in darkness forever. “Perhaps, he thought to himself, “this is why the Bible described hell as ‘outer darkness. '” Away from all that is good, that is warm, that is love. David was startled out of his dark reveries by the alarmed beeping of one of the machines behind him. “What the hell is that?” he said, louder than he had anticipated. His room filled with nurses intent on making the noise stop, but he felt strangely calm and aloof from the activity. He felt no pain at all, so he supposed there was nothing to worry about. As quickly as they had appeared, the noise had been silenced, and all but one nurse has filed out. “You are OK, Mr. Solomon, is there anything I can get for you?” the nurse calmly queried. David shook his head. “So strange,” though David to himself. Here he had been, contemplating the role of fear in his life, and some emergency had popped up, and he was calm. Was he really no longer afraid of death? It was possible. He had read about people who had accepted the inevitability and immanency of their death (he momentarily reveled in his use of two big, similar vocabulary words) as a matter of course – when you can do nothing, you just accept it, right? But David had regrets. He hadn’t taken enough chances on his dreams. He hadn’t spent enough time enjoying his children when they were young. He hadn’t loved his wife fully enough, as she most certainly deserved. His wife, where was she? She had been with him so many days here, in a land where day and night can stream together in a morphine-induced continuum. He glanced at the clock – 3:00. “Must be middle of the night,” he thought. She was probably at home getting some rest before another day of bedside vigil next to him. Fear had threatened him. He had become hard. Then his hardness kept him from being happy for a long time. A long time. Blurrp, blurrp, blurrp! The machine behind him was screaming its damned song again. Like a dance of fairies, nurses piled into his room. This time, however, he saw his wife’s concerned face in the hallway. He waved and tried to smile, but wasn’t sure that his lips had actually moved. Just as previously, the machine turned off, the nurses exited, and one stayed behind to reassure him. He declined assistance again. His wife rushed in behind the exiting nurses like water into a eddy. He smiled a deep, genuine smile. He was momentarily distressed that he could not remember her name, but it didn’t matter. She would understand. And she was here. She squeezed his good hand (the one without the IV), and he closed his eyes. “There is no longer any fear of death for those who are loved.” He knew that was a bad paraphrase of many conflated scriptures, but to David, it was scripture enough. She could see in her eyes that he must not be doing well. He calculated in his mind. It was only 4AM, she was early. He had just had two “episodes,” or at least the machines had said so. But he felt fine. How much morphine was he on? Probably enough to feel very little. He felt a darkness at his feet, moving up his body. But it was not cold, it was warm. He looked at his wife. He wanted to comfort her, but knew he could not. He wondered what she would say to God about him when she got there too. He searched his cloudy brain for something to say. He breathed in sharply and with all of his strength, still not knowing what he was going to say. “We are loved, baby. Thank you.” Well, not exactly what he had wanted to say, but it would have to do. He was no longer afraid. He submerged into the warmth of love. It was his only hope.